One of them that is being worked on and used as a tourism village model is Tablanusu, Deprape District. The village is selected as models because it has cultural and coastal tourism. For this purpose, Jayapura local goverment opened land access since late 2008. Before land access is opened, to go Tablanusu, people must use Jhonson boat (boat with outboard motor). It takes about half an hour from the Depapre port. Now, after land route is opened, it takes only 15 minutes from the capital of Depapre District. From Sentani, only takes about one hour by motor vehicle, either two or four wheels. Moreover,there are already airport taxis available from Sentani with a rate of 50 thousand rupiahs(Us $5 ). Depapre district itself presents history tourism related to World War II. At the harbor, allied forces led by General MacArthur had landed. The historical evidence is the tomb of allied forces on Ifar hills. Also, there are relics of a fuel tanks to suupply forces’ war vehicles. Meanwhile, former harbor leaving only piles of wood. For those who like natural attractions, Depapre offers natural panorama with greenand broad grassy hills. Approaching Tablanusu Tourism Village, visitors are greeted with a road that split through the hills near the coast. From the height of the hill, visitors can see the blue and calm scenery of Tanah Merah Bay as well as small island mounds. Beach at Tablanusu is unique. 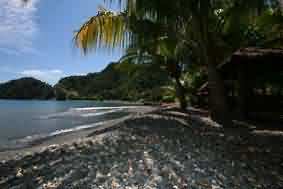 Unlike other beaches that are generally sandy, beach in Tablanusu is covered with soft gravel with a diameter of 1-4 centimeters. The shape is similar to the slippery river stones. Walk along the coast gives the distinguished sensation. When trampled, the gravel makes unique sounds. With bare feet, the journey can be compared to reflexology. Interestingly, the gravel are not only scattered in the coastal region, but also in the yard, even inside villager’s houses. There are also found many large puddles that become a natural pond on the beach. And the natural ponds also have the same gravel at the bottom. As a tourist location model, many facilities are already built in Tablanusu. There are hotels, or, those who want to be nore ‘natural’ can enjoy living in the huts made from palm tree trunks. 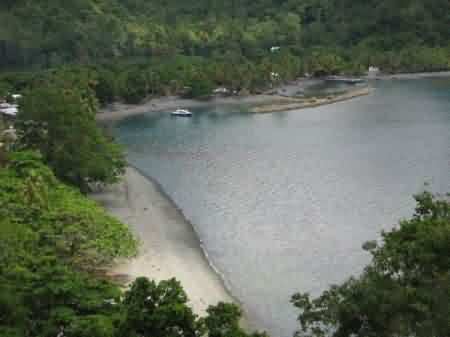 Not only beach tourism, Tablanusu also has adventure tourism by trekking to the hills behind the village. On the right moment, cultural tourism is also reflected by the appearance of typical dances of local communities.